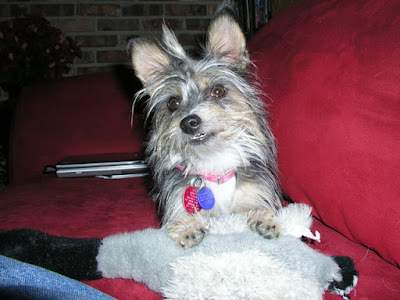 A few months ago, on a pet food run to Petsmart, I bought the duck below for Bambi. She'd eviscerated uncounted toys in the last few years, and it was time for a new one. Within a day, she'd bitten into the poor inanimate object and removed the squeaker, and not long after that we tossed the squeaker. Most of the toys she'd had, she removed the squeaker, and subsequently removed all the stuffing. But not with this one. She'd left it mostly intact. Carried it around, shook it from side to side to be sure it really was dead, several times a day. Lexie has claimed the duck. She de-stuffed it a bit more than Bambi had, then started doing something I'd never seen a dog do with a stuffed toy - she started sucking on it. Or rather, she started suckling it. Now why she does it, well, the best reason is that she sees Bambi as a mother figure and it smells like Bambi. Or maybe that she was taken too soon from her mother. And maybe, just maybe, that duck reminds her of her mother in color. And maybe we won't dwell on any of the reasons - we'll just stick with the fact that she's darn cute when she does it.